by Barbara Skimin. On Screen Digitizing 7mm Decorative Stitches on VM, VQ, NV, PC, ULT, NX, QC, Models, Unlimited Pattern Updates. My Custom Stitch Digitizing for Brother VM6200, VM5100, VQ3000, VQ2400, Quattro NV6750, NV6700, NV6000, ULT2001, ULT2002, ULT2003, NV5000, NV4750, NV4000, NV2800, NV2500, NV1500, NV1250, NV1200 NV1000, 500, QC1000, NX2000, NX850, NX650, NX600, NX450, NX400, PC8500 8200 6500 6000 420PRW, and Comparable Babylock models by Brother. 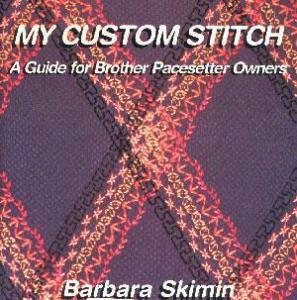 A Guide for Brother Pacesetter Owners Do you want stitches that look like hand embroidery? Or an unusual stitch that no machine has? Here''s the book to show you how. Barbara Skimin has written an easy and fun guide to the My Custom Stitch feature on your Brother ULT2001/02/03, the PC-8500 and the PC-6500. This book will teach you everything you need to know about My Custom Stitch. It includes in-depth instructions for creating your own custom stitches, complete instructions for four projects and detailed information on Brother''s Pacesetter models. If you can imagine it, you can create it! By Barbara Skimin of Sew Spectacular, this book will teach you everything you need to know about My Custom Stitch on your Brother sewing machine. The My Custom Stitch feature is a powerful tool that lets you extend your machine's range of built-in stitches. You can make stitches that look like hand embroidery, a stitch you've seen on another machine, or almost anything you can imagine! For Use With: PC-8500D, PC-6500, Innov-ís 2500D, Innov-ís 1000, Innov-ís 1500D, Innov-ís 4000D, PC-8200, ULT-2001, ULT-2002D, PC-8500, Innov-ís 1200, QC-1000, Quattro® 6000D, Innov-ís 2800D, Innov-ís 1250D and any other of later models with My Custom Stitch. How To Use 'My Custom Stitch' On A Brother Sewing Machine by Angela Wolf. "My Custom Stitch" is a great feature on Brother sewing machines that lets you create your own stitch pattern and save it to your machine. Here's how to use "My Custom Stitch" step by step! One of the benefits of sewing is the capabilities of adding your own unique style to every project. This tutorial will show you how to expand on that creativity by designing your own custom stitch. The stitch options include a single stitch, triple stitch, or a combination of both. VIDEO: How to Design Your Own Custom Stitch by Angela Wolf. The My Custom Stitch™ feature is available on select Brother machines including the DreamWeaver™ XE VM6200D that I use in this video. There are multiple ways to design your stitch, including touching the screen and selecting a point. With the repeat function, the new design can be stitched over and over and you can even save the stitch design to the machine! I have used the My Custom Stitch™ feature to create my own look when top stitching on jeans and embellishing fabrics for home dec and accessories. Be sure to share photos of your custom stitches on Facebook and Instagram tagging us at #StitchingSewcial and @BrotherSews. Very pleased and was stunned when my order arrived from USA to Canada to my door so very quickly. All stores should be like yours! Ordering from Allbrands is simple & easy. And your items are shipped much faster than stated on website. All of the items I have received are exactly what they were advertised as. Thanks you Allbrands!! You have me as a customer for life!! Lots of stitches to try on my Brother NX450, makes it easier to design my own after browsing. I would recommend book to others interested in decorative stitching details.